Upgrades and substitutions in kits can be made by phone or by leaving a comment during checkout. We will swap out the equipment and charge or deduct any difference in retail price. Keep the kit discount and get exactly the gear you want. WesSpur rope climbing kits include the essential equipment needed to install a line and enter a tree in the Moving Rope Technique (MRT). This technique requires less gear and is simple to set up and understand, though more physically demanding than SRT. (The Premium kit contains gear for Stationary Rope System (SRS) ascent). These kits can be expanded later with ascenders or other gear to make climbing easier. All kits contain a work positioning lanyard and adjuster for working the tree, the Tree Climber's Companion as a guide book, and storage gear bag. Each kit gives you a great discount and solid starting gear. Petzl (Sequoia) Size 0: 25" - 31" Size 1: 28" - 36" Size 2: 32" - 47"
10% Off PPE, Ropes, and Hand Saws when you buy a Climbing Kit with coupon code: "KITPLUS". 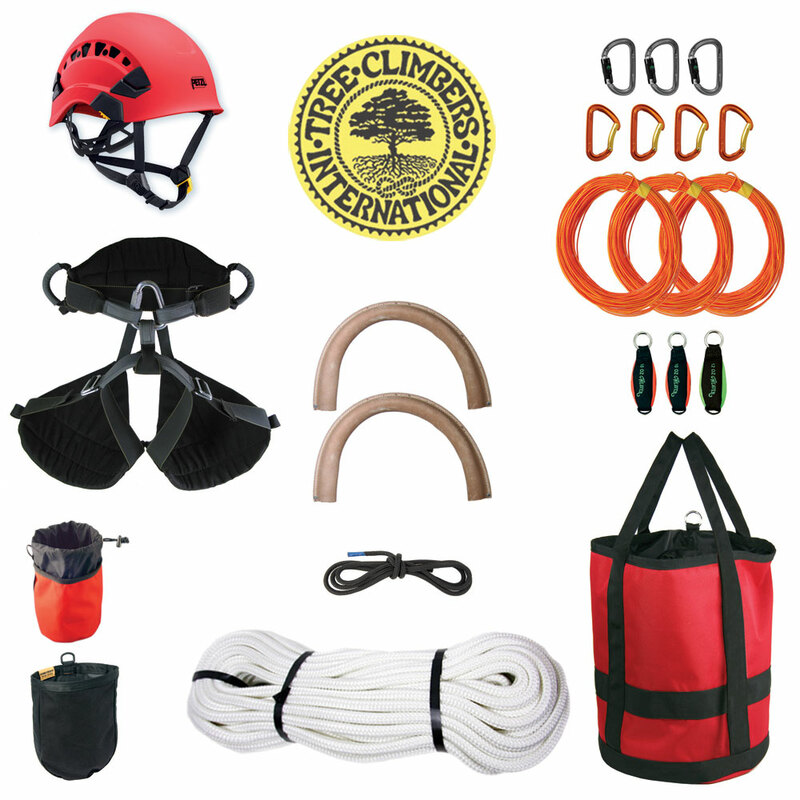 Applies to: Tree Climbing Helmets, PPE, Climbing Ropes, or Hand Saws purchased on the same order as any Spur Climbing Kit, Rope Climbing Kit, or Combo Kit. Some items excluded. This is the best starting rope climbing kit on the market! This is our recommended kit for entry-level climbers who have a limited budget but nonetheless want quality equipment. We’ve upgraded the rope in this kit to Samson Arbor-Plex, and switched out the split tail system for an eye and eye prusik (the same climbing system as the Deluxe kit). These changes make ascension and canopy movement smoother, and offer more versatility in how you use your kit. A Hawkeye rope flipline is included to aid in work positioning. The split-suspension harness is durable and comfortable, featuring a wide, padded back and a leather-lined sit sling. 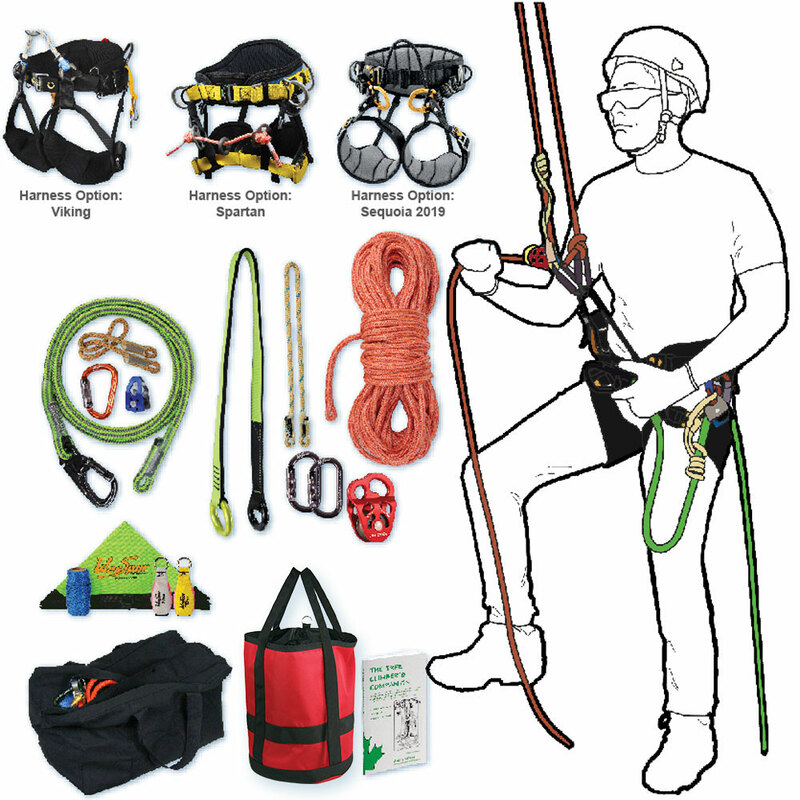 This kit also includes the Tree Climber’s Companion, an essential guide to knots, techniques, safety, and gear for beginning climbers. It also comes with a burly, military-style duffle bag to hold all your equipment, and built-in savings. Video Overview by Niceguydave and WesSpur 2018 Climbing Kit Update. This is the perfect kit for professionals who spend a lot of time in the canopy. Vortex Hot is a full 1/2" double-braid climbing line that combines high-strength and excellent performance. Features Edelrid cambium saver, Zing-It throw line, cordura throw weights, and Hitch Climber pulley with carabiners and prusik for a MRS climbing setup. You have 3 high-performance saddle options for this kit: The Viking is a professional harness that is a great all-around workhorse. The Spartan is modeled after the Buckingham Ergovation, and is a heavy-duty, super comfortable saddle. The Petzl Sequoia is lightweight, sleek, and low-profile. A canvas gear bag, WesSpur rope bag, and throw line cube provide storage and deployment solutions. This Premium kit gives you a high-quality, streamlined set of gear that lets you climb in either a moving rope or stationary rope system with the Rope Wrench. The SRS setup includes a foot ascender, knee ascender, and Rope Wrench with Chest Box - this lets you climb with a super efficient ropewalker system that will speed you into the tree. The new drenaLINE rope is built for SRS with minimal stretch and maximum performance. Combine that with the treeMotion harness, and you have a premium set of climbing gear for ascending and working the tree. Also included are Petzl throw line/weights, an Edelrid cambium saver, and a Petzl Transport rope bag for to keep your gear organized and ready for quick deployment. This kit is premium equipment for professional users who want a full range of options. Featuring a mix of new gear and returning favorites, this kit brings together the best components Petzl offers and gives you a complete spurless DdRT climbing setup. The gear in this kit is designed to keep weight to a minimum and execution as simple as possible. As a result, this is a great choice for beginners and veterans alike. The new and improved Zigzag definitively out-performs traditional hitch systems and, coupled with the Zillon, provides precise and easy work positioning. The adjustable friction saver can be set from the ground to make the setup process faster. The 2014 Sequoia is lightweight, low-profile, and optimized for comfort. Dyneema-coated Airline finds the sweet spot between flexibility and stiffness, allowing precision throwing while avoiding knotting and tangling. The entire kit fits perfectly in the Petzl Transport haul bag for ease and comfort, and weighs an incredibly-light 26 lb. 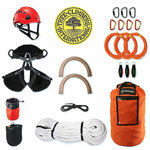 This kit is designed for a recreational starting tree climber. Contains everything a new recreational climber needs for doubled rope technique climbing. This kit is designed by Peter "Treeman" Jenkins, founder of Tree Climbers International and ideal for TCI students branching out on their own!. This kit was developed by Tree Climbers International for graduates of its Climbing Program for Entry-level Tree Workers. It is perfect for anyone just starting out, with long-lasting, high-quality gear at a great price. Kit comes with the New Tribe Onyx Harness, with Rock Exotica Hydra pulley for the bridge attachment. See list of contents below. Foot Ascender: 1 x CT Right Foot Ascender (ASC185-R*) *Right foot. Left available by request.